Walking and climbing in the mountains gives me an opportunity to see some amazing and beautiful rock formations. I sometimes regret that I don’t know enough about geology to always fully appreciate what I see, but what little I do know makes what I see and climb a little more amazing. It’s great that I don’t have to be somewhere with soaring peaks to experience amazing rock forms. My trip last weekend to the Yorkshire Dales was full of stunning rock in the area around Ingleborough, from limestone pavements, to scars, potholes and Norber Erratics. 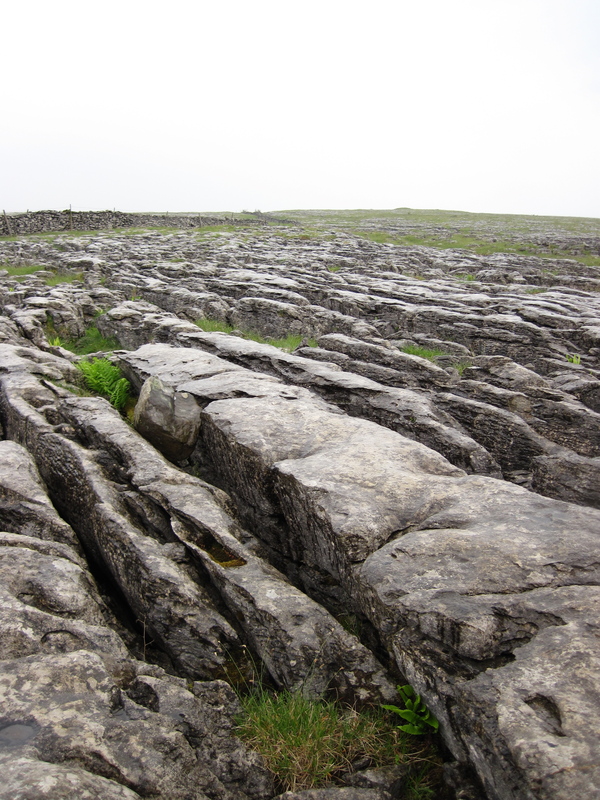 Limestone pavement is amazing. Horizontal expanses of white and grey limestone cuts into weird, organic blocks and slabs. These expanses of wonderful rock shapes are the results of millions and millions of years of geological processes. 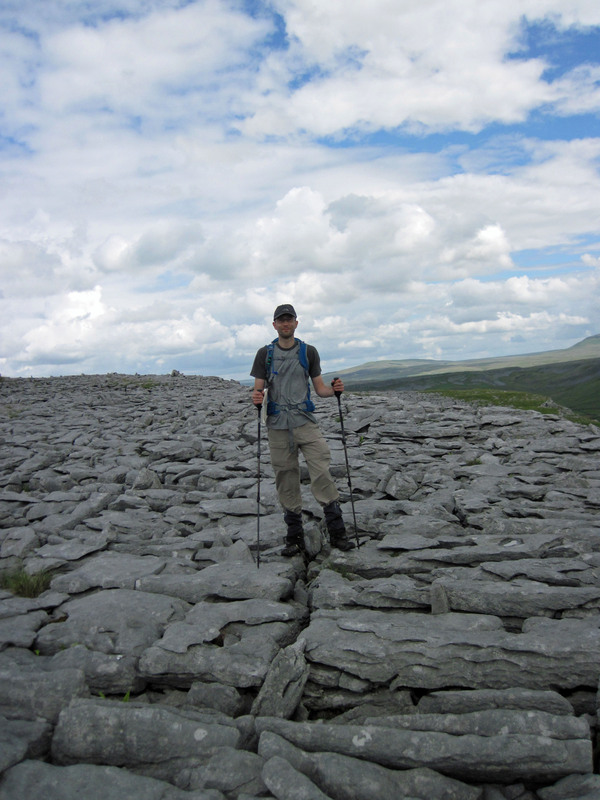 Limestone pavement at Sulber on the slopes of Ingleborough in the Yorkshire Dales. Limestone is a sedimentary rock formed of the deposits of plant and animal remains on the floors of ancient seas and is laid down in layers. Glaciers revealed this rock as they scrapped over the land during the last ice age, removing soil and loose rocks. As these glaciers retreated they left flat besd of limestone and a thick layer of glacial till (basically clay made as the glacier grinded boulders underneath itself). Wind-blown materials were then deposited on top and, over time, developed into a covering of soil. Limestone is slightly water-soluble and this effect is enhanced if the water become mildly acidic through absorbing carbon dioxide from the atmosphere or decaying vegetation in soil. Water in the soil on top of these limestone beds worked its way through cracks in the rock, slowly widening them and creating a pattern of blocks. 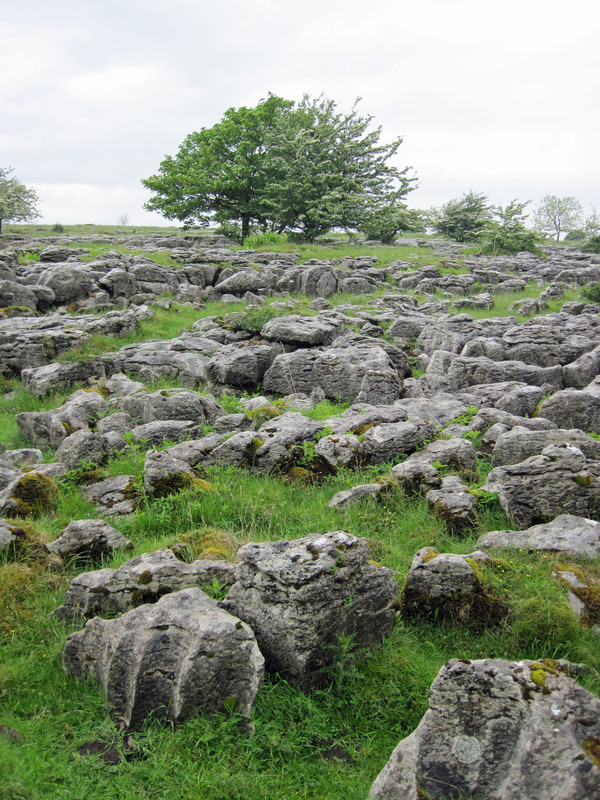 These limestone pavements were then exposed by erosion, speeded up by human’s deforestation and grazing of livestock. 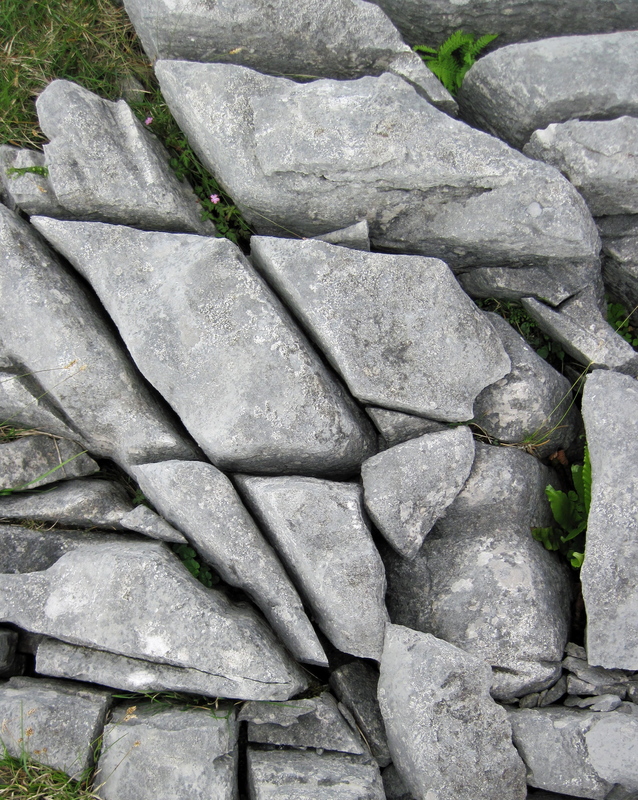 If a limestone pavement was exposed due to the loss of soil, they are more weathered and looked sharper. If they have been underground for longer, then the rock looks more rounded. Walking through the Yorkshire Dales last weekend I could see this difference between the large expanses of exposed pavement and the smaller bits of limestone just beginning to work their way up through the fields. 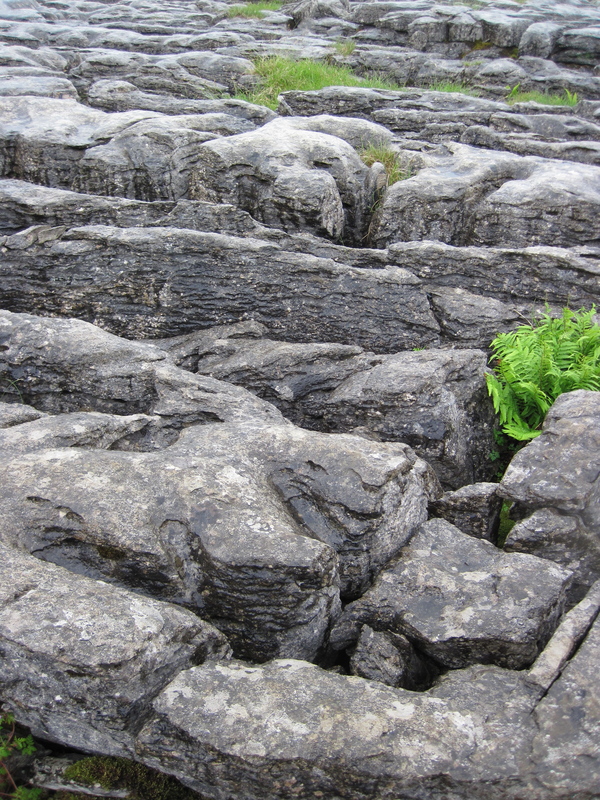 The names of the different features of limestone pavement come from local dialect. The geometric pattern of blocks are known as clints and the deep, vertical groves that separate these slabs of blocks are known as grikes. As the glaciers that stripped the land, and exposed the limestone beds that would later become limestone pavement, retreated they left behind rocks that they had carried with them. 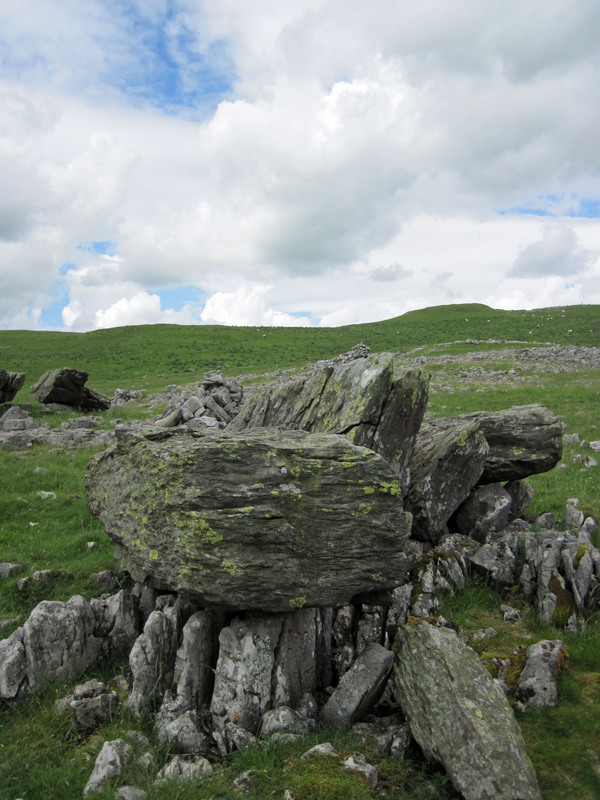 These pieces of rock were different to the rock in the area where they are left and are known as Norber Erratics. There is a group of them above Robin Proctor’s Scar near Clapham and it is these I walked past last weekend. A Norber Erratic above Robin Proctor’s Scar in the Yorkshire Dales. These are gritstone boulders from Crummackdale, about a kilometre to the north, perched on top of white limestone. I really like the fact that you can find these out-of-place rocks balanced on smaller rocks because a glacier left them behind. 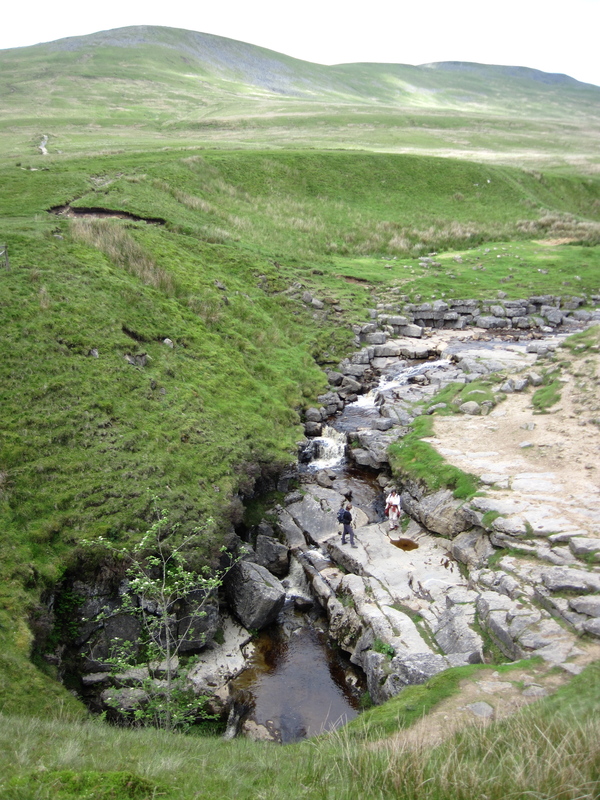 Potholes are a major feature of the Yorkshire Dales – shafts and caves created by water boring through the limestone. Probably the most famous, and certainly biggest, of the potholes in the Dales is Gaping Gill. What makes this pothole so special is that what is a fairly large hole on the surface gives way to underground spaces of amazing dimensions. Gaping Gill and Fell Beck, with the summit of Ingleborough behind. The floor of the shaft of Gaping Gill is more than 100m (300ft) down and as Fell Beck disappears into it these waters become the longest single-drop waterfall in Britain. This waterfall lands in the main chamber of Gaping Gill, the largest cavern in Britain at 140m (460ft) long and almost 30m (100ft) wide and high. There is an amazing panoramic view of this chamber on the website of the Bradford Pothole Club. 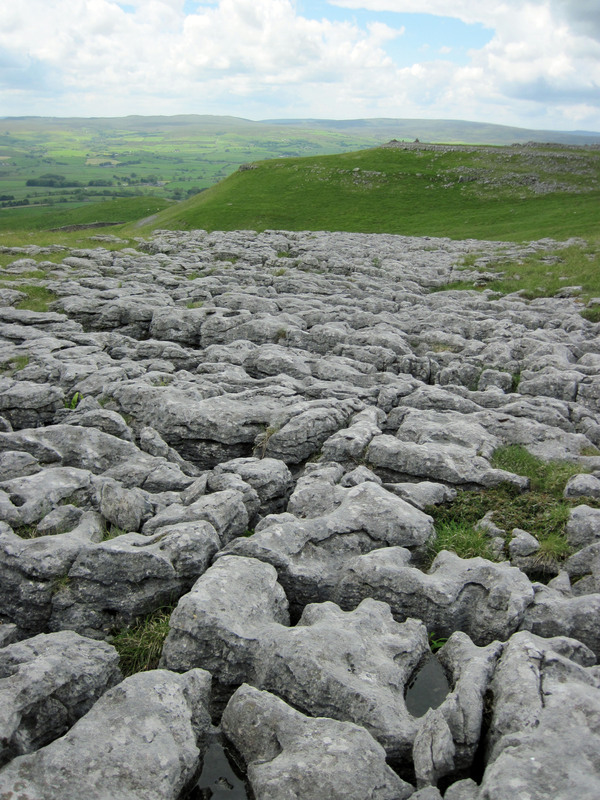 The amazing geology of the Yorkshire Dales are a big part of why it is such fantastic walking country and of why I like them so much. 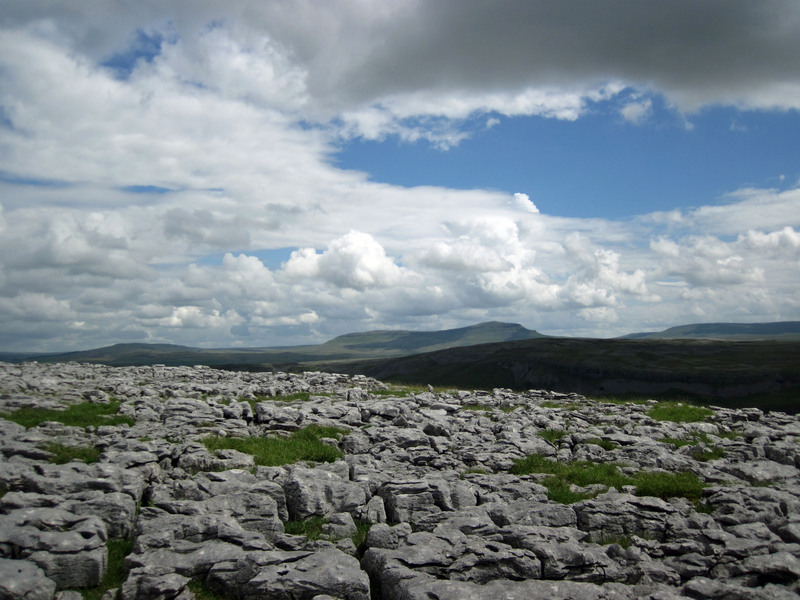 Limestone pavement with Pen y Ghent in the distance. Thanks. I could easily have just kept taking photo after photo as I like the landscape there so much.